SARLAHI, April 15: Five people were killed and 42 others sustained injuries in three different accidents that occurred in various parts of Sarlahi district on Sunday. Three people died when a bus skidded off the road in Lalbandi Municipality-1, Nawalpur along the East-West Highway. The accident occurred at around 5 am. Reportedly, 32 people sustained injuries. Among them, the condition of five is critical. The ill-fated bus (Ba 3 Kha 1318) was heading toward eastern Nepal from Kathmandu. Workers of Joshi Hydropower, Sindhupalchowk had reserved the bus to return home. The deceased have been identified as Anil Urau, 23, of Duhabi Municipality-8; Babli Urau, 22, of Gurahi Ganga Rural Municipality-6 in Morang; and Shreekanta Chaudhary, 40, of Ramdhuni Municipality-9 of Sunsari district. Five of the critically injured passengers including helper of the bus Raj Kumar Nepali have been referred to Biratnagar-based Neuro Hospital for further treatment, according to Police Inspector Kiran Neupane of Area Police Office (APO), Lalbandi. Other injured patients are undergoing treatment at local hospitals. Police have arrested Lakpa Chirring Sherpa, 40, of Madi Municipality-7 who is the owner as well as the driver of the bus. As per the preliminary investigation of police, it has been found that the driver was drowsy and the vehicle was moving in high speed due to which the accident occured. 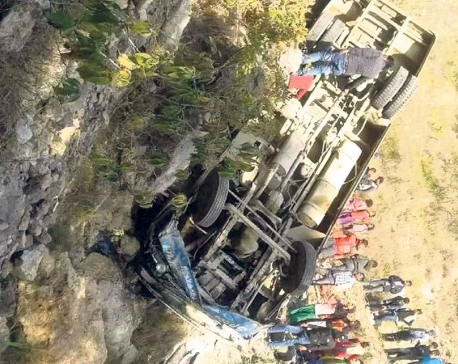 Meanwhile, a person died and 10 others were injured when a jeep veered off the road in Kabilasi Municipality-10, Salempur on Sunday afternoon. The jeep with Indian number plate (BR 01 PD 5951) was heading to the district headquarters Malangawa. The deceased has been identified as Chiranjibi Pokharel, 46, of Bagmati Municipality-8, Shankarpur. He died while being rushed to Malangawa for treatment. Pokharel, was a leader of Nepal Communist Party (NCP) as well as the chairperson of Small Farmers Agriculture Co-operative. Likewise, the ward chief of Bagmati-10, along with other ward members sustained injuries in the accident. Critically injured passengers have been referred to Bharatpur for further treatment. According to the District Police Office (DPO), Malangawa, the accident occurred as the driver tried to protect a motorcycle coming from the opposite direction. In another accident, a woman in Lalbandi-11, died after being hit by a motorcycle. The accident occurred at around 11 am the same day. Mina Jarga Magar, 35, was hit by a motorbike (Na 38 8295), according to police. It has been learnt that the victim was standing in the street outside her house when the motorbike, which was coming in high speed from Bahuni, hit her. Mina died while undergoing treatment in Lalbandi-based Texas Health Care. The motorcyclist is still at large. Caption: A bus that skidded off the road in Lalbandi Municipality along the East-West Highway, killing three passengers on board.